VACUUM Your boat is thoroughly vacuumed, including each and every nook & cranny, glove box, cup holders, seams in upholstery, leather, vinyl, under seats (storage areas) and in-between seats. We vacuum every inch of your interior. STEAM CLEANED All vinyl, cup holders, pockets, cracks, crevasses are steam cleaned while all leather and chrome are safely cleaned and conditioned within the interior of the boat. SHAMPOO All stains are pre-treated. The carpet and any upholstery are professionally shampooed throughout the entire boat. All stains are scrubbed and extracted. UV PROTECTION DETAIL The entire dashboard, steering wheel, pockets, cup holders, glove box, leather, vinyl, and chrome are UV protected and detailed to shine. We will pressure wash your entire trailer, hand dry it, as well as UV protect and shine all plastic, tires and rims. We even apply a UV tire sealant application to help prolong the life of your tires. Chrome Polish: By Quote Only. Interior Everything included in our Full Interior Detail. First, we start with a nice foam bath in order to loosen the dirt and particles from the surface of your boat. Then, we use microfiber towels in order to safely wash the boat without introducing swirls and scratches. All Bugs and grime are removed during this process. Your boat is then hand dried using microfiber towels and blow dried to remove water from hard to reach areas. All interior/exterior windows are cleaned and shined. 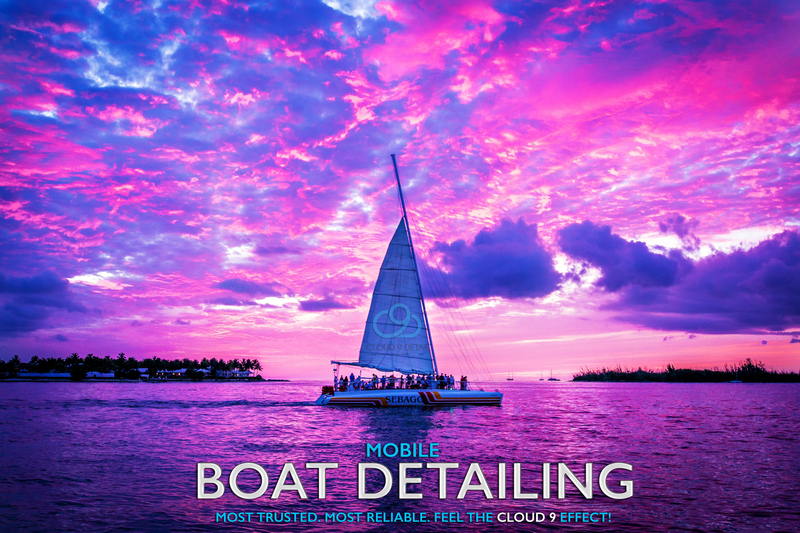 Wax Process: After drying your boat from it’s nice foaming bath, your boat is then prestigiously hand waxed using our high-quality Cloud 9 Wax. Cloud 9 UV Paint Sealant: $49.99 (normally $99.99). Our Cloud 9 Paint Sealant is simply not a wax, but something much better! Our Paint sealant will improve depth, color, shine, and protection. Paint sealant shields the paint from harmful UV rays, environmental pollution, road derby, winter salt/snow and moisture. It is 100x better than a normal waxing. We will pressure wash your entire trailer, hand dry it, as well as UV protect and shine all plastic, tires and rims. We will polish ALL chrome on your boat. When it comes to exterior and interior care, boats are very different from cars. Boats loose their value faster than any other vehicle. One, because owners don’t always know how to properly care for them and two, the elements deliver continuous abuse to its gel-coat, vinyl, carpets, plastics, wood, chrome, and fiberglass. Today’s boats are very expensive, and if not taken care of properly, can be costly to fix. At minimum, boats should be cared for at least once a year. Interior & Exterior Mobile boat cleaning and detailing right here in Salt Lake City, Utah! Most Trusted. Most Reliable. Feel the Cloud 9 effect! Our mobile detailing service is a convenient way to have your car professionally detailed while you work, spend time with friends or family, or do other important things. Car Detailing, Automotive Detailing, Mobile Detailing, Truck Detailing, Van Detailing, Van Cleaning, Truck cleaning, car cleaning, car cleaners, car wash, car wax, truck wax, van wax, wash and wax, wash and wax detailing, Interior & Exterior Detailing, Boat Detailing, RV Detailing, RV Wash and Wax, Motorhome cleaning, Motorhome wax, Motorhome detailing, Jet Ski Detailing, Waverunner detailing, Day cab detailing, day cab detailing, day cab cleaning, sleeper cab detailing, sleeper cab cleaning, ATV detailing, Polaris Ranger Detailing, Motorcycle Detailing, Sports bike detailing and cleaning. Salt Lake City, Utah, Alpine, American Fork, Bountiful, Centerville, Clearfield, Draper, Kaysville, Layton, Lehi, Lindon, Magna, North Salt Lake, Ogden, Roy, West Haven, Hooper, Clinton, West point, Syracuse, South Ogden, South Weber, Plain City, Farr West, Reese, North Ogden, Marriott-Slaterville, Kaysville, Farmington, Orem, Pleasant Grove, Provo, Riverton, Sandy, South Jordan, Tooele, West Jordan, Clinton, Cottonwood Heights, Eagle Mountain, East Millcreek, Herriman, Highland, Holiday, Kearns, Millcreek, Murray, Riverdale, South Salt Lake, Stansbury Park, Taylorsville, West Valley City, Tooele County, Utah County. We have experts on hand ready to answer any questions!